Walking around Gotokuji (豪徳寺散歩) has many historic sites in Tokyo Metro. 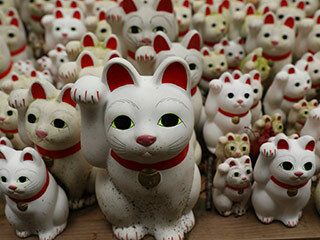 Gotokuji temple is located in Setagaya ward, and it is very famous temple for Manekineko, Lucky Cat temple. This walking starts at Gotokuji Station of Odakyu and Setagaya line and travel 2 shirnes and 2 temples. All of them has great rich history. It is about 5 km long walk. There is no parking, but some restroom spots. 1. use Odakyu Line to Gotokuji Station. Jotokuin Temple is Soto Buddhisim temple established in 1486. It has a nice garden and the main hall is constructed over 550 years ago. This shrine was established in the late 11th century. It has a beautiful pond with many birds. Komainu Dogs are very unique because they have their babies. Gotokuji is one of the popular temple in Tokyo. It was established in 1480 by Kira Masatada. It has many historical buildings that survived from the WWII. The main hall was constructed in 1677. Also, there is a beautiful 3 stories pagoda. The garden is so beautiful especially with Koyo. There is the cemetary of Ii clan. It is also known as the temple of Lucky Cat. Many people donate lucky cats when the accomplished their wish. It was built in late 14th century. Today, it is a park. Shoin Shrine was established in 1882 dedicated to Yoshida Shoin. Shoin was great thinker during Meiji Restoration. He tought many great heroes for the restration, such as Takasugi Shinsaku, Yamagata Aritomo and Ito Hirofumi. They built this shrine for him. There is a restored school of Shoin. End at Shoinjinjamae Station of Setagaya Line.